The letter F inspired ten fantastic Indian flavors! To start off, the beloved fenugreek, used in Indian cooking in three different avatars: First, as a leafy green vegetable, nutritious and delicious with a pleasantly bitter bite. Second, dried, as a herb known as kasuri methi, where the deep distinctive flavor of fenugreek can be added pinch by pinch. Third, as fenugreek seeds, a spice, often ground into a masala with other spices or added while tempering a dish. All three forms can be found in Indian or international stores. The leaves are usually sold both fresh and frozen. First up, a delicious appetizer to whet the appetite: Asha of Foodie's Hope/ Aroma used fenugreek leaves combined with cornmeal and spices to fry up some crispy, golden, mouth-watering "Indian-style hush puppies" or Fenugreek Fritters. Fenugreek leaves team up with radish to make a quick and nutritious Fenugreek-Radish Curry, a contribution by Trupti of The Spice Who Loved Me. Pinki of Desi Fusion Corner packs a double fenugreek punch by combining fenugreek leaves and the dried kasuri methi with some cauliflower and potatoes to make a wholesome and tasty Aloo Gobhi Methi ka Tuk. Fenugreek seeds play a leading role in the Fenugreek-Broccoli curry, an unusual preparation, again by Trupti of The Spice Who Loved Me. She says that even her little son loves broccoli cooked this way, which means that this is a must-try recipe for all broccoli-haters! Want to learn more about fenugreek seeds and their uses? See them featured here by Lydia of Perfect Pantry. First up is fuzzy melon, a wonderful asian squash (new to me) introduced by Pinki of Desi Fusion Corner. Pinki describes the melon and makes a creative dish called Fuzzy Melon ki Sabzzi. Next comes fennel, that beautiful bulb with a frilly top, and the interesting taste of licorice or anise. Linda of Out Of The Garden creates yet another delightful preparation called Fennel with Toor Dal and Garlic by roasting the fennel and combining it with some garlicky dal. What an amazing flavor profile this dal has! Finally, a vegetable that is easily available and well-known: french beans. Verdant and crunchy, fresh french beans or green beans certainly are used in countless Indian dishes. 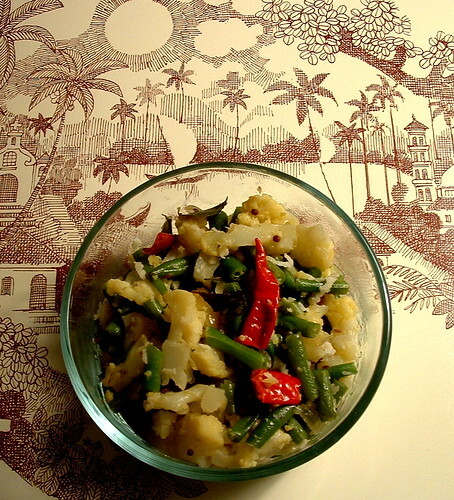 Lakshmi of Veggie Cuisine shares a family recipe for an unusual French Beans Stew. French beans combine with potato and the flavors of ginger and coconut milk...I can just imagine the subtle aroma of this stew. Suma of Veggie Platter shares another delicious recipe with us: She combines french beans and toor dal to make the vegetable preparation even richer in protein, and comes up with a tasty French Beans Sabji. I used french beans too, and combined them with another popular Indian vegetable, the cauliflower or fulgobi. In Hindi, cauliflower is sometimes called just "gobi" or then called "fulgobi" (ful= flower) to distinguish it from "patta-gobi" or cabbage (patta= leaf). Finally, an entry that wowed me by its unusual nature. It reminded me that no matter how many years I spend marveling at Indian regional food, I will keep discovering surprising new preparations. Here, Bee and Jai of Jugalbandi introduce us to Fajeto. A traditional dish from the Western Indian state of Gujarat, it is an unsual curry featuring mango pulp, yogurt and chickpea flour that by all accounts is delicious, delicious! In my eyes, the most incredible recipes of Indian regional cooking are the delicious vegetable preparations that prompted me to start this series in the first place. Stir-fried vegetables are especially dear to my heart. They require little preparation other than chopping of the vegetables, and they retain the essential flavor of the vegetables while, at the same time, dressing it up with a spicy kick. One such regional stir-fry is called foogath. I really have no idea what the term means, except that this preparation is from the coastal state of Goa, the land that brings us those other exotic-sounding curries like the "vindaloo" and "cafreal". 2. Garnish with some grated coconut. Simple and delicious, foogath is generally made with cabbage or french beans, but I see no reason why one can't make it with, say, cauliflower, or carrots or any combination of vegetables. The dish has a very subtle flavor and you can make it with as few or as many chilies as you like. The vegetables are cooked just until they are tender, so the fresh and delicate of this dish is what makes it so special for me. 1. Prepare the vegetables: Cut half a head of cauliflower into small florets. Cut 2 cups of french beans (green beans) into small pieces (if the beans are not tender, you might have to remove the strings first). 2. Make the tempering: Heat 1 tbsp oil, then add 1/2 tsp mustard seeds, 1/2 tsp cumin seeds, 2 fresh chilies cut into thirds, 1/4 cup minced onion, 5-6 curry leaves. Stir around for a few minutes to infuse the oil with all the spices. 3. Add 1/2 tsp turmeric and salt to taste, stir for a few seconds. 4. Stir in the vegetables. Add 1 tbsp water. Cover and cook on medium-low heat, stirring occasionally, until vegetables are tender. The idea is to let the vegetables steam in their own juices to retain as much of the flavor and nutrition as possible. 5. Turn off the heat. Stir in 2 tbsp grated fresh coconut (can use fresh-frozen). Squeeze on the juice of half a lemon (optional) and garnish with minced cilantro (optional). The background on the foogath above is a place-mat printed with a drawing from the celebrated Indian cartoonist Mario Miranda. 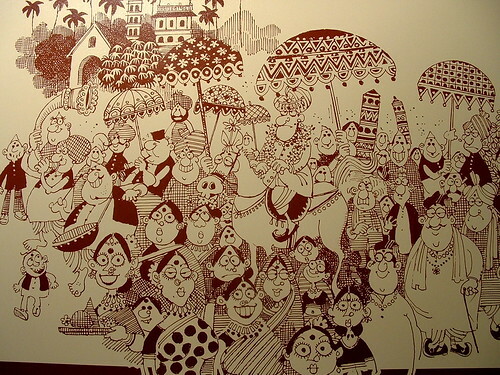 He is based in Goa, and his cartoons and line drawings are infused with the joy and spirit of the people of Goa. Last time I visited Goa, my dear childhood friend Chinu (who lives and works in Goa, the lucky lucky thing) gifted me a set of these place mats. Here is another one, a more typical representation of Miranda's style, depicting an Indian wedding: check out the disgruntled bridegroom and the gaggle of relatives! Goa is a fascinating place and would have to be my favorite destination in India. Some day, I will devote a whole post to this lovely land. With its endless beaches and joyful, laid-back residents, Goa provides an oasis in the hectic frenzy that is India. For some gorgeous pictures of vibrant Goan life and some delicious Goan recipes, you have to visit Mahek's blog. Another Indian blogger, Deccanheffalump, also writes often of her travels through Goa...for instance, check out this description of a traditional Goan dessert to see why I am such a fan of her writing. I love it best with some rice and dal for a simple home-style meal, but it would go well with rotis (flatbreads) too! Corn Upkari from Aayi's Recipes. Had to check out u're roundup first thing this morning! Lovely lovely dishes! Each one of them is a class apart. I love this event .. it is so helpful to have simple recipe for everyday vegetables. And not to mention, I love your writing style! Waiting for the "G" parade next week! I've finally figured out how to leave a comment here. (If others are having trouble, if you right click on comment and open it in a new window, then the comment window will open properly.) Hooray! Wow! This is fascinating.Fenugreek is a spice with a 'therapeutic' quality. It lowers Blood sugars too.and is therefore used as part of 'sauteing' all vegetables in south india along with mustard seeds , red chillies , cummmin seeds etc. mario miranda.....you made my day. 'foogath' as one of my recipe books tells me, is any dry veggie made with coconut and spices. These are good posts, the pictures are so nice, I will try these recipes at home. Lovely roundup Nupur....will have to come here when I am out of ideas for dinner from now on! Thanks for rounding up all these delightful recipes Nupur. The foogath sounds excellent! Another excuse for me to visit the grocery stores on Chicago's Devon Avenue. Beautiful photography too. A quick question--what kind of chilies do you use? This is SUCH a great series - thanks! So many lovely things to try. I like fuzzy melon quite a lot. It is very similar to bottle gourd (opo squash). Kind of a cross between opo and loofa. It is a summer vegetable here in northern California, and available all summer in Asian markets as well as even normal supermarkets from time to time. I'm loving this series, Nupur. I'd heard of foogath, but had no idea what it is. Now I have a new recipe to try! Thanks for the encouraging words, Latha! Appreciate it! Like you, I also love learning simple new recipes that I can use on a daily basis. Kalyn, I did not realize that commenting was a problem...will have to see what is going on. Oh, you *must* visit India...it will be a memorable trip for sure. Anon, yes, I do like using it for that reason too. Bee, also a Mario Miranda fan, eh? He is such a funny and irreverent guy. Thanks for the foogath info! Thanks, Terry! The chilies...well, I use so few of them at a time that I have started buying frozen packs of green or red chilies. That way one pack lasts for months rather than buying them fresh and wasting them. Frozen chilies are sold in the freezers of Indian or international stores. Diane, really? Thanks for sharing all that info about fuzzy melon...I will keep an eye out for it here in summer. Thanks for linking to one of my posts! Kamla (Bhat) has mentioned you the couple of times we have spoken! Good things! And, ooo, Mario Miranda place mats...I wish I could look at hose as I ate! And, thanks to Kalyn, for figuring out and letting the rest of us know how to leave legible comments! 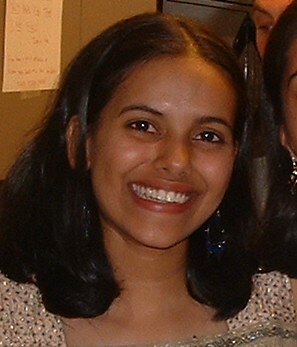 Thanks Nupur, was getting ready to cook dinner, thought of foogath. Decided to check on your version. It as usual turned out fantastic. I try out a foogath usually with cabbage, sometimes with French beans, if I can find them. Also keeping freshly grated coconut is an issue. Thanks again. Will go searching for Mario Miranda placemats, he used to live close to my husband's ancestral home. Unfortunately he is no more. Take care. Looking forward to more delicacies.